Alonso-Pérez was born into a family of artists in 1881 in Saragossa, a city with a richly diverse history. Not only was it part of the Roman Empire, but it also was identified with the first century Christian miracle of the Virgin Mary appearing to Saint James the Great by standing atop a pillar in the town center. Beginning in 712, it was settled by the Moors who remained there until driven out by Christian armies four centuries later. As the central city of Aragon, it was also a target for the invading Napoleonic army in 1808. Such a mixture of local heritages must have offered the young Pérez exceptional opportunities for observing the remains of many cultural traditions. Perhaps more important for a fledgling painter, however, was the knowledge that Francisco Goya, an iconic figure by the end of the nineteenth century, had also been born in Saragossa. Little is known of Pérez’s early education except that his father, Mariano, was also a painter and presumably provided his son with instruction in the arts. The elder Pérez’s painting was characterized by a preference for anecdotal costume scenes similar to those by Mariano Fortuny, who was one of the most successful Spanish painters of the time. Fortuny’s career was both international and wildly successful; and his early death in 1874 at age 36 only increased his fame. With Fortuny leading the way, European and American art collectors alike were fascinated with nineteenth-century evocations of eighteenth century genre paintings, an aspect of the rococo revival that would eventually influence the development of art nouveau in the 1880s. Like many others of his generation, Fortuny had apprenticed in Rome, but later moved to Paris where the commercial art market was strongest; by the 1860s, Paris was home to a substantial community of Spanish, mostly Catalan, artists. The lure of Paris—and its growing number of private galleries—proved to be an important outlet for the Pérez family as well. 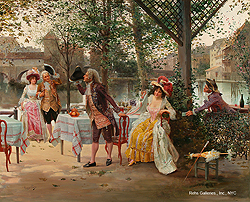 Artistically, Alonso-Pérez followed in his father’s footsteps by painting light-hearted genre scenes that were loosely based on eighteenth-century models. Many of these depict flirtatious encounters, such as The Billiard Lesson, which are reminiscent of the rococo themes of François Boucher, or alternately, the daily activities such as Going to the Market, which echo the focus on bourgeois life espoused by painters like Jean-Baptiste Greuze in the 1770s. 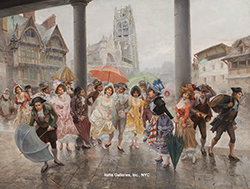 However, Pérez also painted contemporary life in Paris, often using a blend of late nineteenth century settings and fashionable costumes from an earlier period. Much of the men’s clothing, in particular, reflects eighteenth-century fashion, including the powdered wigs and tricorn hats, while the women’s clothing is often less definable as being from a particular time period. This curious juxtaposition suggests that Pérez was experimenting with the style he inherited from his father—and the tradition established by Fortuny—in an attempt to find his own unique style. 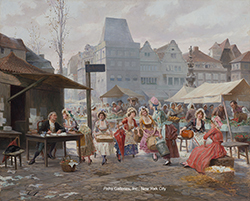 In addition, there are a number of paintings, such as those of Paris’ central market, Les Halles, which depict the industrialized world of cast iron construction and modern commerce. Similarly, Pérez was influenced by Impressionist approaches to color and light. His work often seems to be inspired by Pierre-August Renoir, whether in his images of beautiful women seated in a variety of interior settings, or in his lively portrayals of cheerful gatherings at riverside cafes. 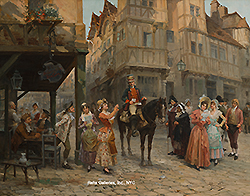 Even when the figures are clad in old-fashioned costumes, the surrounding environments are often handled with an emphasis on the changing play of light on surfaces and textures. These types of paintings, generally small in size, no doubt found a ready market among bourgeois collectors. Pérez’s artistic production also includes designs for woven silk tapestries for Neyret Frères et Cie of St. Etienne in the Rhone Valley region. These commissions were probably the result of his father’s earlier design work for the company, which made small scale silk tapestries as a side line to its primary business of designing luxury ribbons for special medals, opulent millenary and haute couture fashion. One of Pérez’s tapestries, clearly signed with his name, depicts a fashionable young couple disembarking from a carriage in front of a gothic church. In addition to tapestry designs, Pérez also created lithographs such as the Bal époque Louis XV now in the Louvre’s collection, and prints for publication in a variety of art journals. No doubt this work was a means of providing basic income for a young artist. The most notable of these publications were in German, suggesting that Pérez was wisely expanding his geographic horizons in an increasingly international art market. He seems to have initiated this type of work in the early 1890s when he was still quite young, and probably still living in Spain. The first documented print publication dates from 1895 in the German magazine, Moderne Kunst IX where a nostalgic print of Our Grandparents’ Dinner Table was included. The most frequent outlet for his print publication, however, was Wilhelm Spemann’s monthly journal, Vom Fels zum Meer (From the Rock to the Sea); based in Stuttgart, Spemann was well known as a publisher of cultural and artistic journals and books. Pérez provided prints for him for at least two years in 1895-1896, and perhaps longer. In general, these images seems to have been targeted at a middle-class audience who enjoyed depictions of scenes such as A Rendevous, Flirting at Billiards, and Stagecoach Passengers. Based on the titles, these prints may well have been based on Pérez’s paintings of the same themes. Little is known about Alonso-Pérez’s last decade. He does not seem to have exhibited at the Paris Salon after 1901, and there is no documentation of his print work in later publications. He died in 1914 at age 33. Pintors espanyols a Paris, 1880-1910, ex. cat., Fundació Caixa , (Barcelona: Fundació Caixa, 1999), 176-178. Explication des ourvrages de peinture, sculpture, architecture, gravure et lithographie des artistes vivants, (Paris: Imprimerie Paul Dupont, 1901), 160. Friedrich von Boettcher, Malerwerke des Neunzehnten Jahrhunderts, Beitrag zur Kunstgeschichte, vol. 2, (Leipzig: H. Schmidt & C. Günther, Pantheon-Verlag für Kunstwissenschaft, 1901) 235.